I am a normal Facebook user who spends 2 hours of average daily time on this world’s favorite social network. With a regular use I slowly became friends with 500 plus people and liked more than 100 pages over the years. Just like me we all got lots of friends and page likes in our profiles. So just like the streets of our cities, our social network accounts are also getting crowded. And in this crowd you may miss what you don’t want to. To avoid this Facebook has introduced a new feature called “See First”. What is ‘See First’ feature? It ensures that you see the updates of your close friend, or favorite page at the top of your News Feed. The posts come at the top of your news feed with a small star icon on the post. For using this new feature, you just need to tap the “Follow” button on friend or page, there you can see Un-follow or See First. 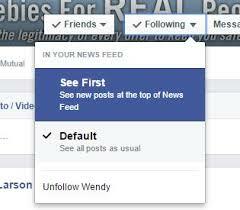 This new feature gives you a control by letting you to allow what you want to see more in your news feed. In this way you would be updated with your close friends and favorite pages. Facebook doesn’t inform the person that you have made him/her to show at the top of his news feed. You would say that how this new feature is different from news feed settings, which Facebook introduced last year. Earlier you could change the settings of the news feed by simply un-following any friend/page or flagging by clicking “I don’t want to see this”. For people you always wanted to be updated with, there was “Close Friend” option to get the notification every time they post. So I would say that there is no difference, but an up-gradation to the news feed settings. The impact of ‘See First’ on Marketers. It may further reduce the organic reach. Its worth discussing if a user gives priority to friends or brands to include in ‘See First’. If users are more close to friends due to personal or emotional connect, they may ignore the brands from see first. Which means, unlike the regular posts the ‘brand posts’ which are already affected by limited organic reach will get even less consideration in the news feed. As a result the reach may further go down. Can Marketers use ‘See First’ feature as a marketing tool? As its a new feature, I haven’t yet come along any campaigns run along this feature. Although, brands can plan a 2-3 weeks long series of campaign & ask users to ‘include their brand in See First’, so they do NOT miss any posts of the campaign and increase chances of winning more. Brands which are doing a constant giveaways might see a lot of people adding them to ‘See First’. 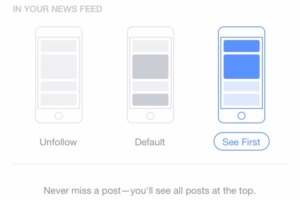 So basically Facebook is exploring new ways to improve its experience, and running a small test of its new feature “See First” which lets you select the people/pages you would like to see at the top of your news feed. Though Facebook’s edgerank algorithm tracks the affinity of users with respect to page/profile and shows them relevant content; it still lacked some accuracy. Hence this new feature would be a better asset for users, but at the same time it would force the marketers to come up with some unique promotional ideas. Please share your thoughts & opinion on how the ‘See First’ feature can impact the businesses & brands.